Some of this information comes from articles in the Clinton Herald 06 Aug 1991 found in a scrapbook given to us by Jan Hanson and the FCCFH. In 1836, Dr. George K. Peck of Lake Pleasant, N. Y., was a guest of Elijah Buell. He searched a good town site and settled on what he considered the ideal place to lay out a city and selected the name Camanche then went to Chicago to sell lots in the new community. In 1837, Dr. Peck's son Franklin K. built the first structure -- a hewed log house 18 by 20 feet which was soon sold to Chicago businessmen who opened a general store. There was a ferry to bring people over from Albany. Beginning in 1838 the first school was taught by Ann Eliza Thomas. Classes were held in private homes until a brick school and public meeting house was built in 1851. In 1840 Camanche became the first county seat. In 1841 it was moved to Vandenburg (DeWitt). From 1851-1856, more trade was done there than any where else in the county. 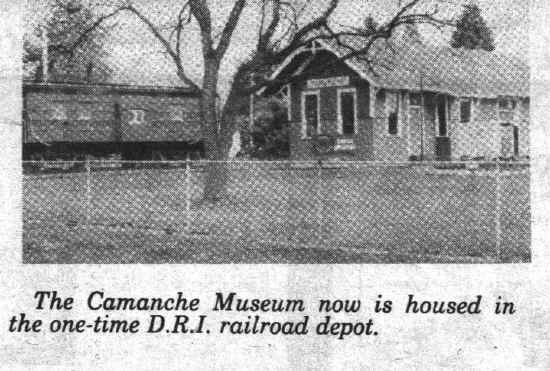 On Oct 1, 1856, there were 256 buildings in Camanche which included 15 stores, 175 dwellings, three churches, two schools, four hotels, one bank, two sawmills and several livery stables. Population was listed at 1,200. 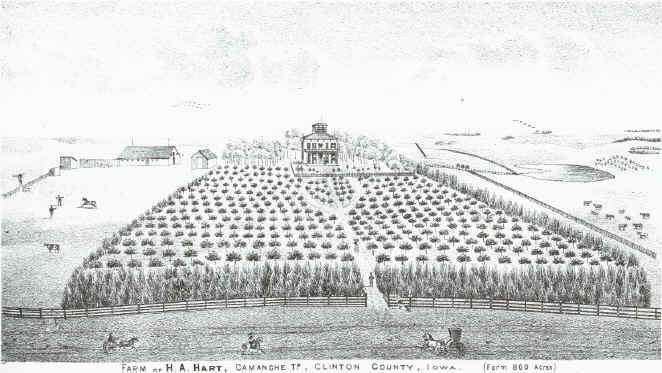 Camanche was host to the first county fair in 1859. 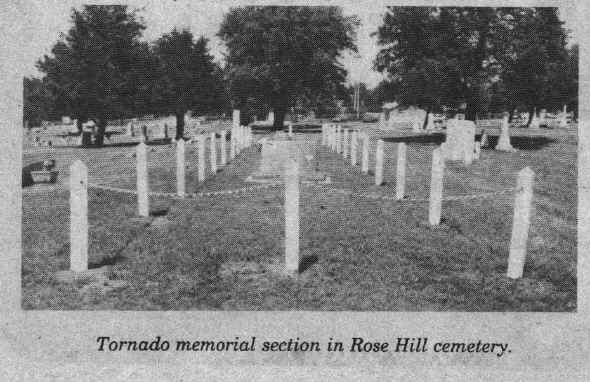 Rose Hill Cemetery is one of the oldest maintained cemeteries in the state. One of the first to be buried there was the city's founder in 1838. One of the first newspapers in the county was the Camanche Chief, established in 1854 by Bates and Knapp. Thomas Long was the first county attorney and it was to his home that the bodies of 19 tornado victims were taken. The first physician was Dr. J. P. Anthony who opened his office in 1850. 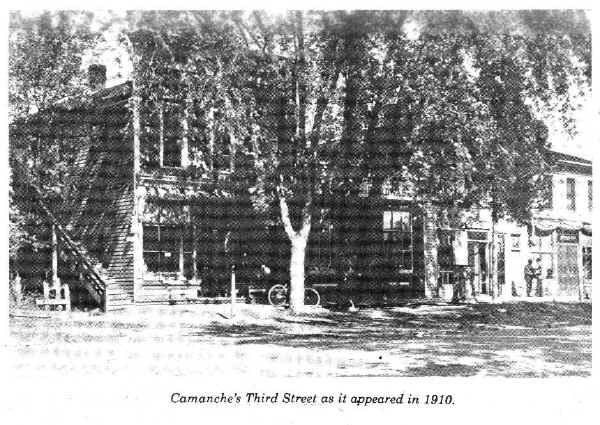 The city of Camanche was incorporated by an act of the Iowa legislature in 1857, becoming one of the 60 original charter cities in the state. Only four remain -- Camanche, Davenport, Wapello and Muscatine. In less than 3 minutes on June 3, 1860, Camanche was virtually wiped off the map by the fiercest storm in Eastern Iowa history. The deadly tornado left 29 dead and 76 seriously injured. 228 buildings were destroyed as well as scores of horses and livestock. Not enough furniture was found after the storm to fill a 9 by 12 room. (More on the Tornado) A combination of pride, dedication and hard work has brought the city back to the point where, in the 1970 census, no other community in the state could match its population growth. The beauty of the Mississippi which attracted early settlers also encouraged industry to locate in the area. Commercial fishing and clamming played a key role in Camanche's economic history. 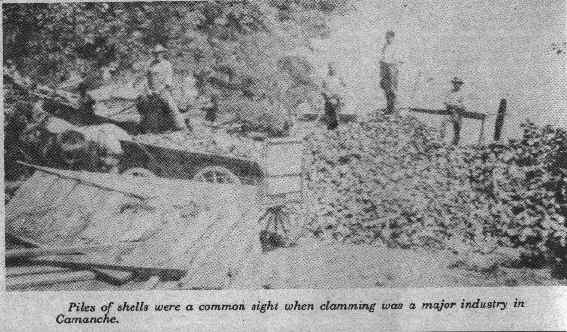 At one time clamming provided a living for 40 percent of the community's inhabitants. Development of a process to manufacture buttons from clam shells opened the door to a booming clamming industry. Some of the most productive clam beds in the Upper Mississippi were located near Camanche. Not only were loads of shells shipped daily to Clinton or Muscatine button factories, but there was also a ready market for the pearls found in them. Prestigious jewelers in Chicago and New York sent their representatives on buying trips to Camanche several times each year. At one time Camanche was the second largest pearl market in the U. S. The invention of the plastic button caused the clamming industry to start fading fast in the late 1920's.